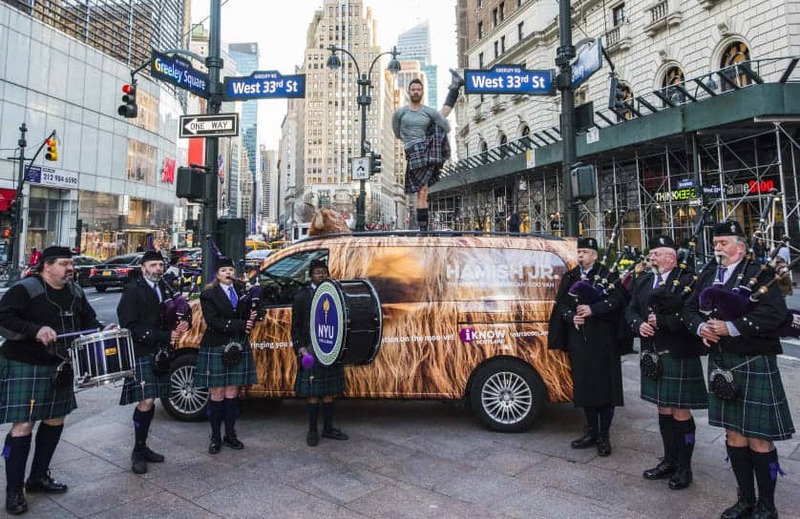 The latest addition to VisitScotland’s herd of popular Highland Coo Vans limbered up with internationally renowned Kilted Yogi, Finlay Wilson, in preparation for driving along 6th Avenue in the New York Tartan Day Parade. Hamish Junior, the Highland Coo Van, will be a regular sight for New Yorkers on the streets of Manhattan this week before joining the parade on Saturday (6 April), which is this year led by Grand Marshall Sir Billy Connolly. The bovine-themed mobile information centre forms part of Team Scotland’s activity during Scotland Week under the Scotland is Now global campaign banner. Scotland Week is an annual week-long celebration of Scotland’s links with the USA, held in New York, which culminates in the parade. Other activity for Scotland Week includes a diaspora breakfast and a ‘taste of Scotland’ event, organised in partnership with the Scottish Government and Scottish Development International, in which attendees can practice their putting in the shadow of The Solheim Cup, have a Scottish virtual reality experience, try some kilted yoga, hear stories of Scotland’s past and sample Macallan whisky. Hamish Junior is a temporary addition to the small herd of VisitScotland Coo Vans which have delighted visitors across Scotland since their roll-out three years ago. Hamish, Morag, Archie and Heather, along with their trained Coo-Visors, are seen at events, visitor attractions and tourism hotspots, providing inspiration and information to visitors during the summer visitor season. Scotland is Now, which launched last year, builds on the nation’s acknowledged strengths as a land of unrivalled history, breath-taking scenery and warm welcomes, but shines a light on lesser-known qualities: a pioneering, dynamic and progressive nation taking the lead on key global challenges. Tourism Secretary Fiona Hyslop said: “Scotland Week is the ideal opportunity to promote Scotland as a place that people will want to visit, as well as study, live and work. This is particularly important in the face of continuing uncertainty over the UK Government’s proposed exit from the EU. Malcolm Roughead, Chief Executive of VisitScotland, said: “Scotland Week is a prime opportunity in the Scottish tourism calendar to promote and celebrate Scotland’s strong links with our largest international market. “Hamish Junior is a welcome addition to our popular herd of Coo Vans and we hope his introduction for Scotland Week will not only turn heads of New Yorkers but turn them into visitors also.